Heavily armed men have displaced entire townships in northern Colombia after the government refused to compensate former coca farmers, according to the United Nations. The local farmers’ association ASCSCUCOR said more people were displaced on Sunday and said that it seems the government of President Ivan Duque and the Cordoba governor’s office are legitimizing the forced displacement and the dispossession of land in the area. According to United Nations, unidentified armed men entered parts of Ituango and Puerto Libertador on Thursday with the order to clear the townships. These families were forced to move because of the presence and threats of armed groups in the area, who on March 21 informed the inhabitants that they had to leave the townships; the affected population is being housed in the region’s parish house and in the homes of relatives and acquaintances. On Sunday, “employing the same ‘modus operandi’, heavily armed men arrived at the townships Rio Sucio, Soledad and Rogero… giving the order to vacate all homes, expelling all families of these communities that consist of approximately 200 families,” the farmers’ organization said. 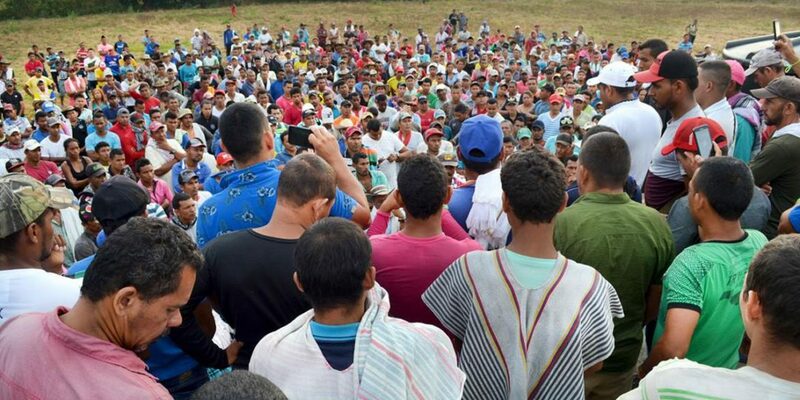 The two mass displacement operations coincided with clashes between police and at least 1,000 farmers who blocked the road on Thursday, claiming that the government refused to deliver the substitute crops they were promised for voluntarily removing coca crops. Emilio Jose Archila, the High Councillor for Stabilization, lied to us in a vulgar and blatant manner; he sent us a message to say that he could not comply with the inclusion of families in the program. Ten farmers were injured on Sunday when riot police unit ESMAD violently ended the roadblock. Around the same time the unidentified armed group forced the local inhabitants to clear the entire area. Acting Governor Sandra Devia denied knowing about new mass displacements. They are telling us more displaced persons will arrive, but we have sent support from both the army and the police and the monitoring airplane did not detect new displacements. Notwithstanding, the army is prepared for any situation that may occur. According to the farmers, the military has not taken any action since Thursday when the armed men initially ordered the entire clearing of the area and the local farmers’ association raised the alarm and farmers who had sought refuge in a local refugee camp rose up and blocked the road. Farmers who voluntarily removed their coca crops after the government promised substitute crops have complained the government has failed to keep its promise across Colombia. But only in Cordoba these farmers have claimed the government did not just refuse the promised assistants, but were removed from their farmland by unidentified armed men entirely. The Ombudsman’s Office warned about the situation in Puerto Libertador in November last year about pending violence because rearmed former FARC guerrillas had begun an offensive from the south to expel the AGC paramilitary group that assumed control over the strategic drug trafficking corridor after the demobilization of the FARC in 2017.